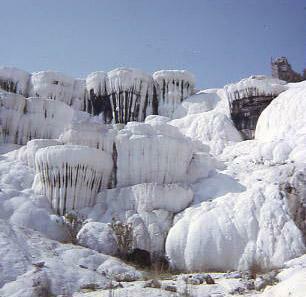 Hierapolis-Pamukkale was an ancient spa: the hot springs here have been used as a spa since the 2nd century BC. Under Hellenistic and Roman rule, it became a healing centre where doctors used the hot thermal springs as a treatment for their patients. 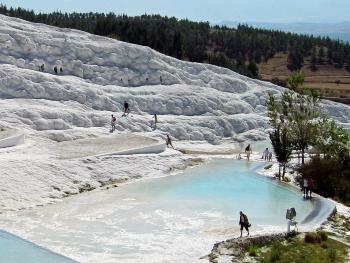 The designated area also includes the natural sight Pamukkale, located in the same town. Pamukkale consists of a landscape of white terraces with travertines (terraces of carbonate minerals left by the flowing water). I hated it. After the fascinating eastern Turkey, this was a big disappointment. I found the basins not only small, but also spoilt by other tourists bathing in them! These days the ruins of Hierapolis are still there and are worth visiting. The hotels, on the other hand, have been completely demolished after it was decided they were causing too much damage to the site and the whole area was heritage-protected. Whereas once you could swim in the travertines, now security guards keep a watchful eye on anyone trying to get too close. Other than a special swimming pool that has been constructed away from the cliffs, Pamukkale is generally to be seen but not touched these days. In many ways, that’s to be applauded. The site is a truly remarkable natural phenomenon and it would be a pity if human interference damaged it permanently for future generations. There were certainly no complaints from anyone about taking their shoes off. A friend living in Turkey recommended I add Pamukkale to my itinerary when I visited Turkey in 2007, and it was a great recommendation. The calcium terraces of Pamukkale are brilliantly white as you approach them from the village below, and I was in awe at the extent of the travertines. Visitors are required to remove shoes when wading up through the series of pools fed from the hot springs at the top of the hill. The water wasn't particularly hot--it was lukewarm at best--but the views from the terraces were spectacular. At the top of the hill was the Greco-Roman spa town of Hierapolis, because who wouldn't want to build an ancient resort in such a beautiful location! The ruins were typical of other Greco-Roman cities, and included a theater, an arcade, temples, and a necropolis. There was also a hot springs pool at the top of the hill, but unfortunately I didn't have enough Turkish lira available at the time to visit the pool. Logistics: Train or bus to the city of Denizli; minibus from Denizli to the village of Pamukkale. Even 30 years ago the site of Pammukale had been ruined by too much tourism, destructive tourists and hotels, and a lack of mineral-laden water from which these formations were formed. On the other hand the site of Hieropolis is worth a visit. When I was there they were just begining to excavate the theater and there was an amazing amount of beautifully carved stone still in place. But the best reason to visit this city is the large necropolis. It has a wide variety of tomb styles not seen elsewhere and you can enter some of them and see where families had meals to celebrate their ancestors. Also there is a photogenic triple arch gate to the city. The whiteness of the area was very hard on the eyes. Worthwhile to see, but I'm not too sure it's worth more than a pass thru. The springs at the top were well worth the visit - My girfriend said it was like swimming in warm Perrier! 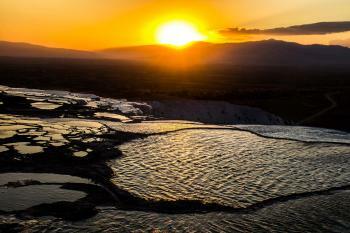 Hierapolis and Pammukale are good places to visit in Turkey. Unfortunately they have begun to suffer from a bit of over-development. This is especially true of the travertine pools. They are now mostly dry and you can no longer bathe in them. Some of them are even artificial now! The ruined city, on the other hand, is pleasant. There are usually not big crowds and even if there are, you can escape them easily enough. The thermal pool at the top of the travertines is pricey (18 lira a pop), but worth it if it's not too crowded. Mentioned in the Bible: Colossians 4:13 - "I vouch for him that he is working hard for you and for those at Laodicea and Hierapolis." Built in the 2nd century BC: For its Greco-Roman spa qualities: "they founded a thermal station on the site in the late 2nd century" (AB ev), and Romans from 129 B.C. Derived from more than one TWHS: Originally two separate nominations (Hierapolis and Pamukkale). 222 Community Members have visited.